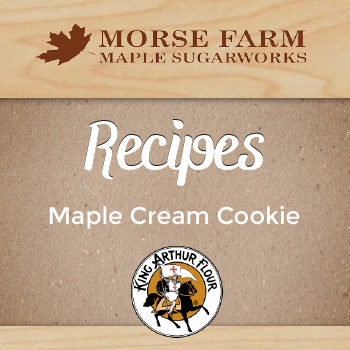 Recipe provided by King Arthur Flour, of Norwich, Vermont established established 1790. Crisp maple cookies surround creamy maple filling in these beautiful treats. Lightly grease the maple leaf molds. Beat together the brown sugar, salt, baking powder, vanilla, maple flavoring, and butter until fluffy. When well blended, mix in the flour. If the dough doesn’t hold together, add another tablespoon of maple syrup. Press about a half-teaspoonful of dough into each mold. Bake for 8 to 10 minutes, until lightly browned on the edges. Remove from the oven and cool in the molds for 10 minutes. Pop the cookies out of the molds by pressing on the end of the cookie. Beat the confectioners’ sugar, butter, and salt together. Mix in the maple flavoring and vanilla. Add the maple syrup a bit at a time, until the filling is a medium-soft, spreadable consistency (the filling should hold its shape). Drop a teaspoonful of filling onto the flat side of a cookie. Top with another cookie, placing the flat sides toward each other. Let the cookies sit for several hours to let the frosting set up, so the cookie halves don’t slide around on one another. Store in airtight containers for several days or freeze for longer storage.